Greetings, Blenderheads! How about some Blender magic? 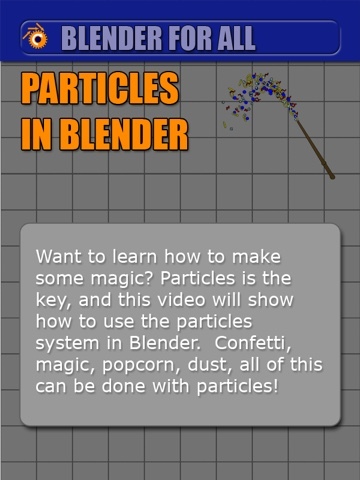 Well, when it comes down to it, Blender has the particle system, which allows you to make ... MAGIC!!! Particles allow you to quickly add objects into a scene from an emitter object. Particles allow you to make little particle points that glow, or you can make particles from other objects or groups of objects, and the possibilities are endless. Whether you want to make a wand shooting magic, or show a rainstorm pouring down, popcorn coming out of a popper, or perhaps show an asteroid field in space, all these could be done using particles. Check out the video here to see how it's done!